Seven days later and I concede autumn is here. Something to do with the 125km/hr winds, 225mm of rain in 48 hours, surfing on our extremely sheltered harbour beach (no, not me, just in case you were wondering), numerous mature trees coming down resulting in the loss of electricity to our street, and just after we spent the entire morning, wading through what felt like a foot of debris, cleaning up, three minutes of ‘the-world-has-ended’ hail stones immediately took the garden right back to where we started, with the added bonus of the few remaining leaves attached to plants having a lovely (?) lacy, shredded look to them. Phew. I can honestly say that despite living in the tropics of Malaysia for two years, I have never seen weather like it. And whilst I always thought I was reasonably proficient at science, I’m am utterly discombobulated (love having an excuse to use that word) as to how the garden can turn white with ice on a 25 degree celsius day, however fast that ice is coming. If I wasn’t already convinced about summer being over, I certainly was after our trip to the Blue Mountains on Sunday to see the autumn colours that sadly escape us in subtropical, coastal Sydney. That’s not to say that we don’t have deciduous plants here. Oh no, in fact my Brugmansia are looking particularly deciduous right now, which is pretty disconcerting, although I am hopeful they will bounce back. But we don’t have the cool night time temperatures to create that classic autumn display. And so to the joys of the Blue Mountains trees. For some reason, I hadn’t consciously missed autumn colours last year, my first in Sydney, but being amongst them this weekend felt really nostalgic. Wrapped up in a warm coat, kicking the leaves beneath my feet, I got quite carried away with the romance of short days and cosy fires. 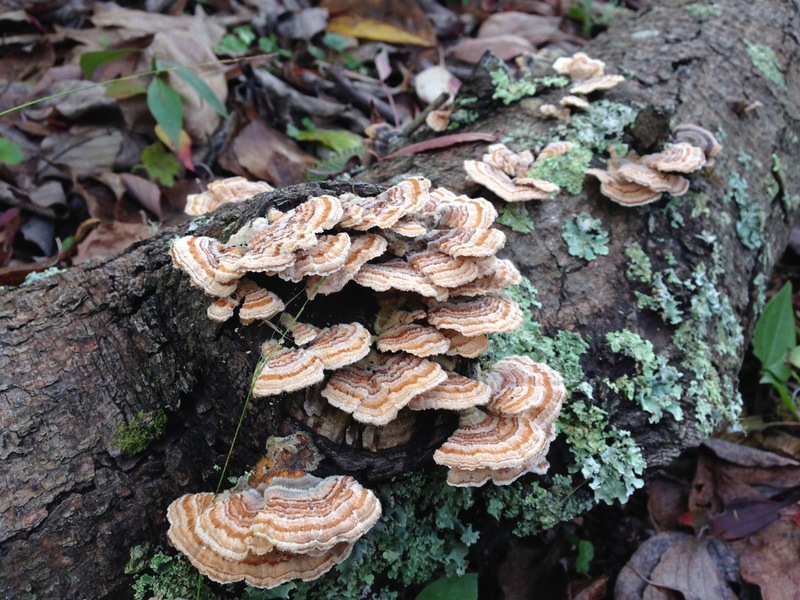 At ‘Woodgreen’ in Bilpin, we saw bracket fungus amongst the rotting leaves, which somehow also felt very English. All part of that damp-under-foot-for-eight-months-of-the-year thing. And even the last remaining flowers reminded me of harvest festival, autumnal colours: reds, oranges and yellows, with a few blackberries thrown in for good measure. Even the succulents had their burst of colour to join in with the rest! 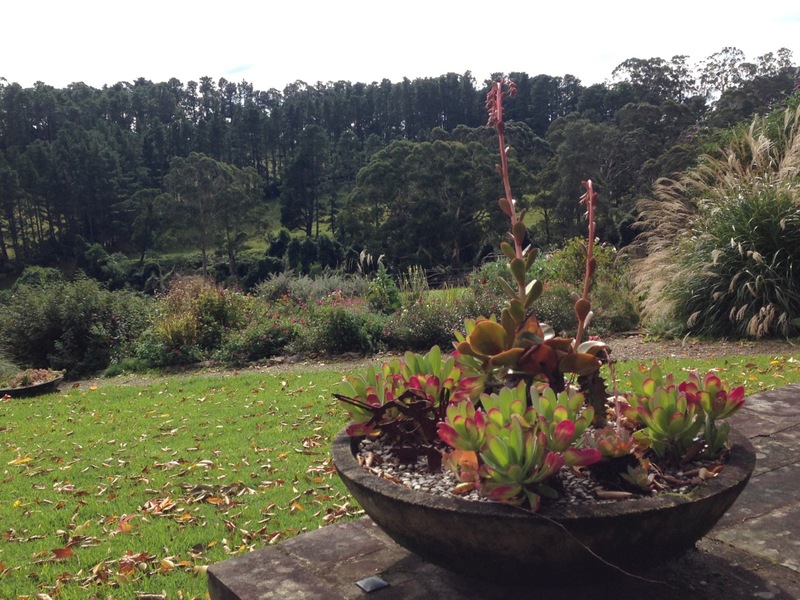 What a view these succulents get to enjoy each day! I always think gardens look quite sad in autumn; tired, worn out, indeed expired and in need of a break. 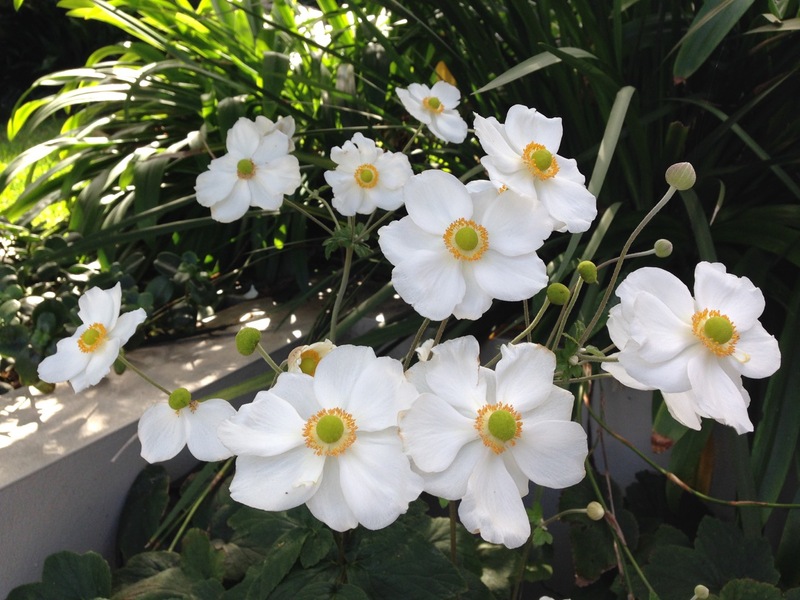 But, of course, the tired, ‘Woodgreen’ perennials are as such due to the amazing displays they put on throughout spring and summer; first the rapid, thick, fresh, spring growth and then the masses of flowers that follow. Plant selection is nothing if not a game of compromises. Most either bring us bursts of pure joy, then periods of rest, or they offer year round structure, minus the dramatic, seasonal ‘wow’. In Sydney, the trend is for 100% year round structure and nevermind the wow. When we enjoy being out in our gardens 12 months of the year, it is hard to accept bare patches of soil whilst so many evergreen plants are available to us. 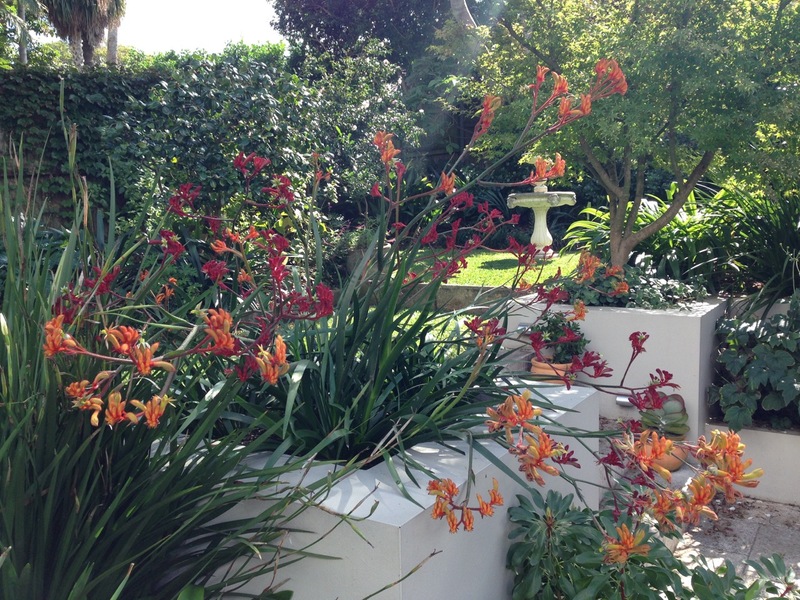 There is also the question of how fitting certain ‘English’ plants are in this land of palm trees and Frangipani. 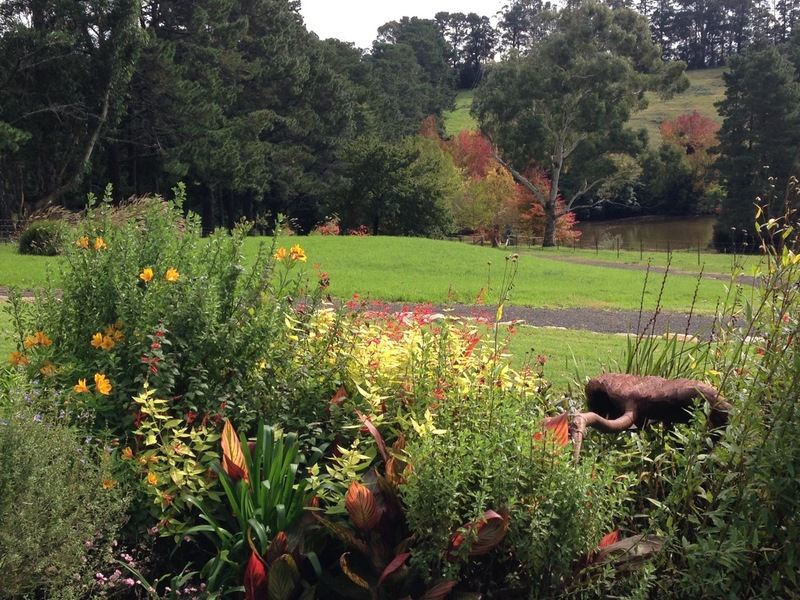 But almost two years into life in Sydney and I so miss the colours, the ‘wow’ and the seasonal changes of cool temperate gardens. I don’t, for one moment, believe we should be trying to create ‘English’ ones, but I do think we are missing a trick. We need greater proportions of evergreens in our gardens here to give that year round structure, but we also need to be clever interspersing them with plants that bring seasonal variation and adequate impact, to avoid a boring, static look. Taking advantage of plants that are summer dormant is a great way of achieving this seasonal change whilst maintaining year round balance and I will be exploring further ideas in a separate post. For the time, I’m enjoying these two autumnal highlights in my garden, or at least I was until last week. 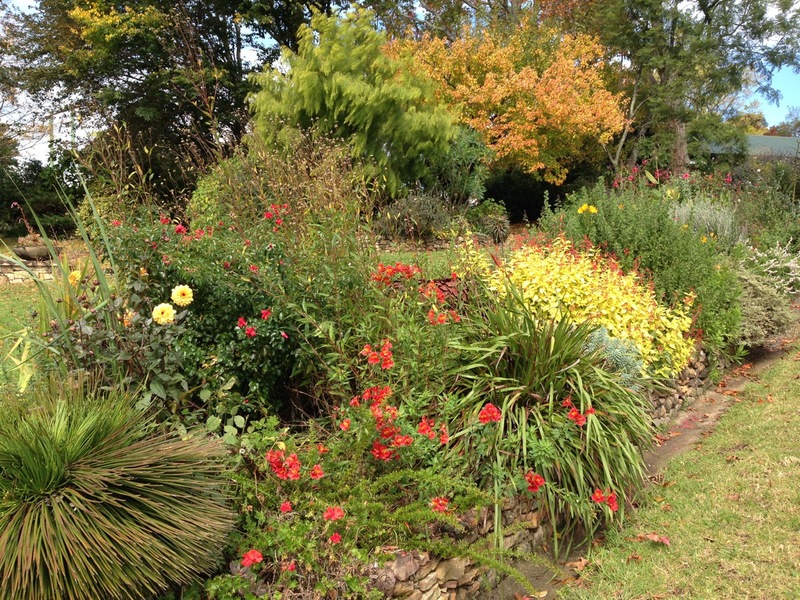 Taken just before the storms, these photos show the plants that shout ‘autumn’ to me. I’ve also been planting like mad for the last two months, planning for seasonal highlights throughout the year, minus the bareness of winter. I’m wanting the best of both worlds and hoping that over time I will get there. For now, I’m feeling rather grateful to be back in the warmth of Sydney and acknowledging that I really am rather greedy in all that I ask for! 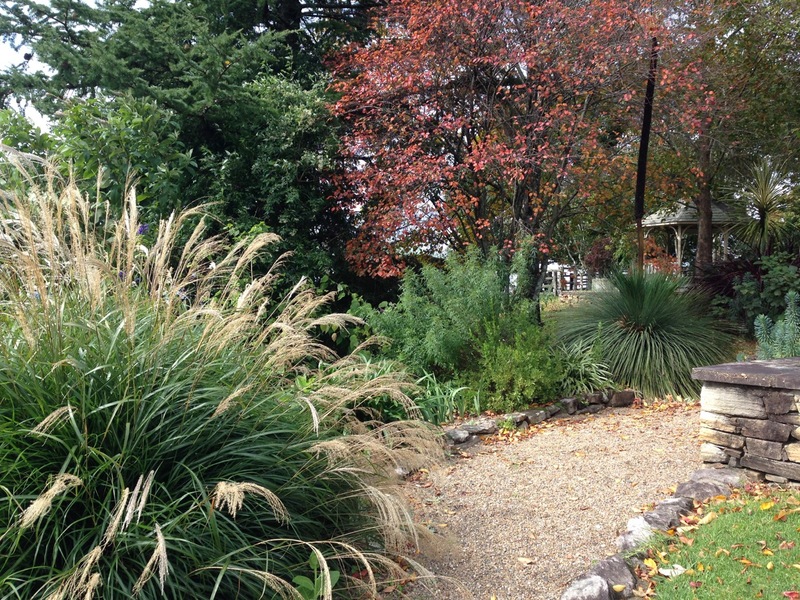 The Anigozanthos in your garden certainly provide that lovely autumn shade. We got the hail here as well, so everything that isn’t waterlogged is looking shredded. Woodgreen has been on my list of gardens to visit, as I see it advertised quite frequently, so it’s lovely to get to see some photos from another point of view. I’m assuming the mystery plant is reasonably established, so the Camellia cultivar could be ‘versicolor’ or ‘hana jiman’ – both of which have good forms – but there are so many pink/white combos that it could be any number of cultivars!!!! You must be on the other side of the mountains to Bilpin – they didn’t get any hail at all. I’m sure you’d agree, it was just awful watching the garden get so destroyed so quickly – but just nothing that could be done. ‘Woodgreen’ is definitely worth a visit, although I would wait until spring now. It wasn’t quite as good as the photos suggested it might be, but then after that week it was hardly going to be at its best. 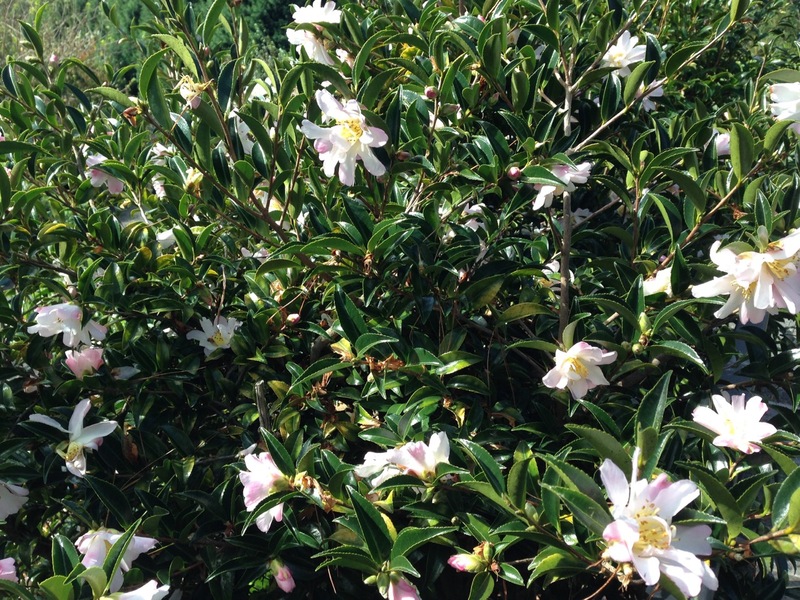 The Camellia was very distinctive in its petal shape – almost like a star magnolia – but I don’t think I’ve worked it out yet! Yes, I’m in the touristy part – Bilpin is about 65km from me…the upper mountains got a good dose of hail…thankfully it didn’t do too much damage (although yours truly held a blanket over a my tree dahlia which is just about to flower – a total rarity in cool climates – and I wasn’t about to let the content of a future blog post go to waste!!!!). Good effort! I hope you were under the blanket with the tree dahlia; I am sure that hail would have been capable of shredding people, too. I found this post fascinating Janna. As I abhor winter cold I never understood why people seem to value seasonal change so much. I always thought I’d be much happier living in a sub tropical climate. But I think I am now beginning to understand it. Good luck with introducing the ‘wow’ factor.. it has to be the way to go to get the best of all worlds. Woodgreen certainly does look very English! Thanks, Jessica. I really abhor winter cold too, but it’s lovely to see a nice side to it, now that I don’t have to contend with it. I actually think it is sun and light that I most love about the subtropics – the cold you can compensate for, but the sun, you can’t – but as I have moved around the world I’ve realised that the grass is always greener…. Everything is also relative – I found myself examining the linen cupboard the other day, worrying in case I didn’t have enough blankets for the terrible weather that was forecast. Then I stopped and realised the ridiculousness of worrying about an overnight low of 12. The good news is, it is fascinating to see how gardens vary throughout the world and there’s nothing I love more than learning new gardening stuff. I think we are always destined to be envious of each other though! I love the look of Woodgreen (we must forgive it’s autumn somnolence) and I can’t wait to explore the beautiful Blue Mountains again soon (not in winter though!) after reading your post Janna. We have just had an overnight of 4 – normal for cool temperate areas of Victoria at this time of the year, as 12 is normal for warm temperate regions such as Sydney. My sister in the sub-tropics of the Sunshine Coast of Qld is complaining that the overnight temperature has dropped to 22! And she also can’t understand the joy I feel at our 4 seasons – and yet 4 seasons here is nothing like the 4 seasons of Europe; nothing is truly dormant in our climate, spring buds are on the trees almost as soon as they lose their leaves (even in cold Victoria). The cooler temperatures give us those amazing autumn colours though and I love the cold nights followed by crisp sunny days. 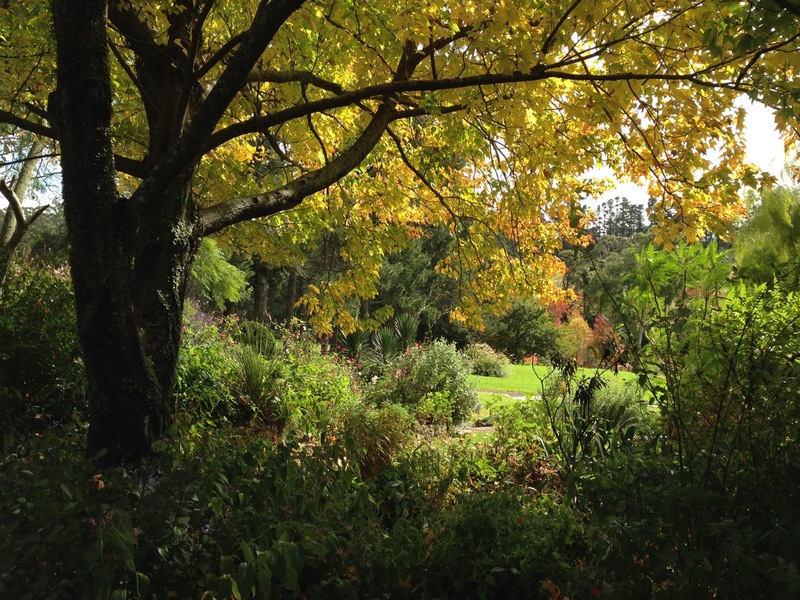 This Autumn has been amazing here both in colour and the way the plants are performing (our mild summer and early autumn rains helped with that). 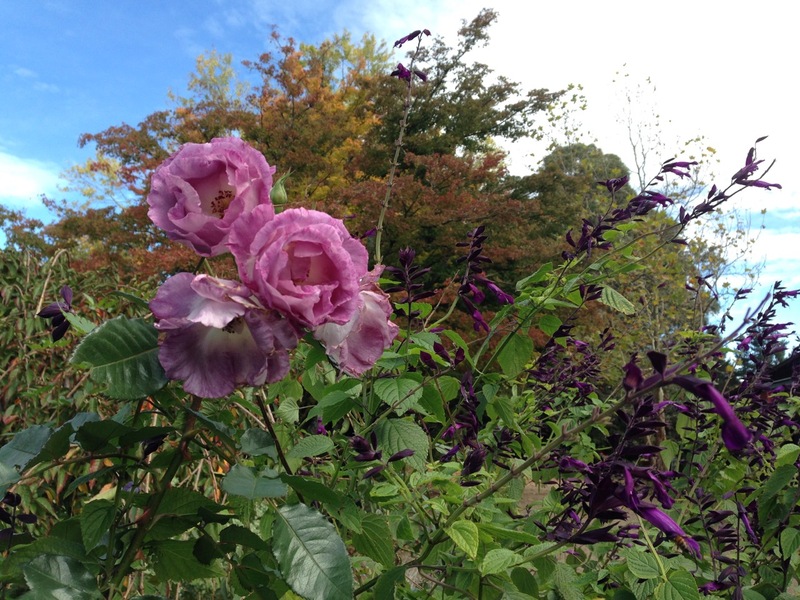 The salvias are stunning, the penstemons constantly flowering, the roses still bravely producing flowers in those vibrant hues only autumn brings and the ornamental grasses are starting to take on their autumn glow. What a wonderful year here for our gardens. I hope your garden has faired well and is bouncing back Janna. Can’t wait to read about your next garden adventure! Thanks, Adriana. All my plants with big leaves (Brugmansia, Frangipani, Alocasia, Megaskepasma, Barlettina, Beaumontia…) need a growing season to recover and my poor Echeveria have shot holes right through them. Only good old, stoic, Acanthus leaves survived in one piece. But I have to think that it adds ‘depth’ to the garden! Gosh, I would be grateful if overnight temperatures had cooled down to 22! I always think day time temps should start with a 2 and night time with a 1. Not that I’m fussy or anything! Fortunately, Sydney pretty much delivers that year round – we are very lucky to be so comfortable, even if not all plants like it. 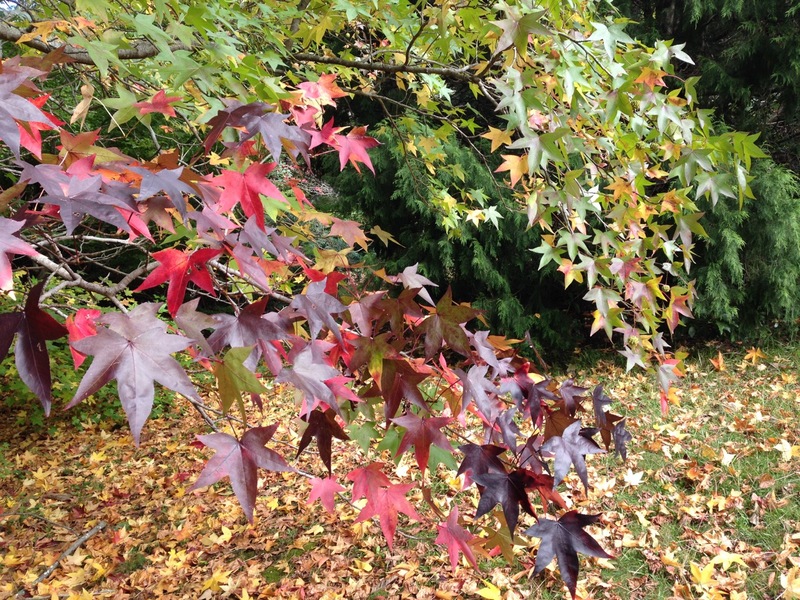 I can look out my window in northern Sydney and see blazes of autumn colour set among eucalypts and conifers – Liquidambar, Nyssa, golden ash, robinia, and a rapidly bronzing Taxodium. As well as subtropical palms, tree ferns, rich purple tibouchina and hibiscus! Plant-wise, it’s a great climate to have your cake and eat it too. However I think Sydney is becoming more uniformly green in autumn as, sadly, people are planting fewer large trees, especially deciduous ones. As its leaves are quite small even for a sasanqua, I’m wondering whether your mystery camellia might be one of the Paradise cultivars. How very lucky you are to have a view of all those trees, Catherine. Gorgeous all year round. I have to say, I was spoilt with the red tints of Canberra in autumn, but you are right, our more subtle tones, en masse, are pretty nice too. It’s just not often that you see them en masse. And yes, those Camellia leaves were very small. I’m grateful to have now learnt about the Paradise cultivars, although I think I’m going to admit defeat on the exact name and put my quest away in the needle-and-haystack-box. Great to read your blog, Janna. I constantly struggle with the evergreen woodies vs. seasonal highlights issue. After last week’s torrential rain, which flattened a lot of my shrubby perennial seasonal things, I started thinking more woody things were the way forward. But a balance is the ideal! Oh dear, if you struggle with it, Deirdre, there is no hope for the rest of us. You are the queen of Sydney balance! My Salvia are also looking extremely flattened, but as they were all quite new, I do have the bonus of them now lying across the bare soil: it almost looks like an established (if slightly low growing) garden bed now! One of the great things about living in Canberra is the four distinct seasons. Autumn is my favourite! 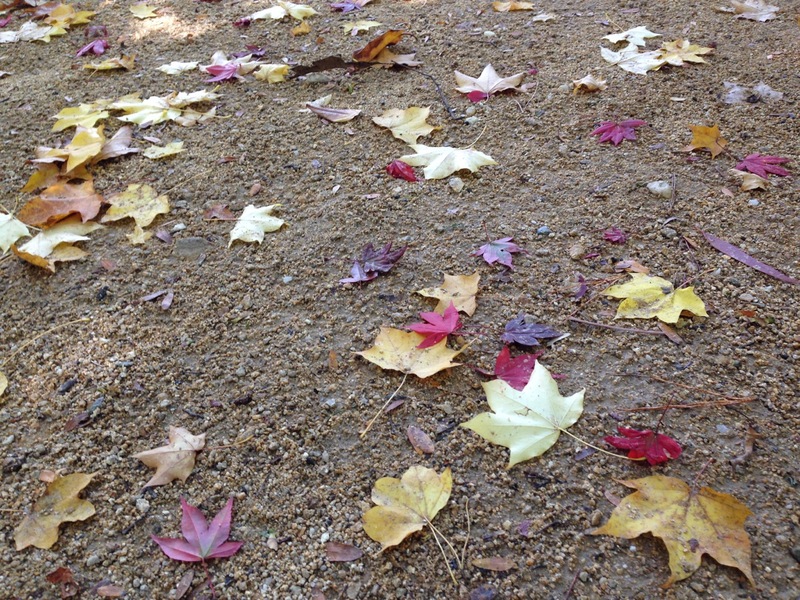 It is lovely to see the many different shaped leaves, barks and colours. The trees are glorious. I am very lucky to admire them everyday from my warm home. Being able to look out towards the Governor Generals, Black Mountain tower and National Arboretum. 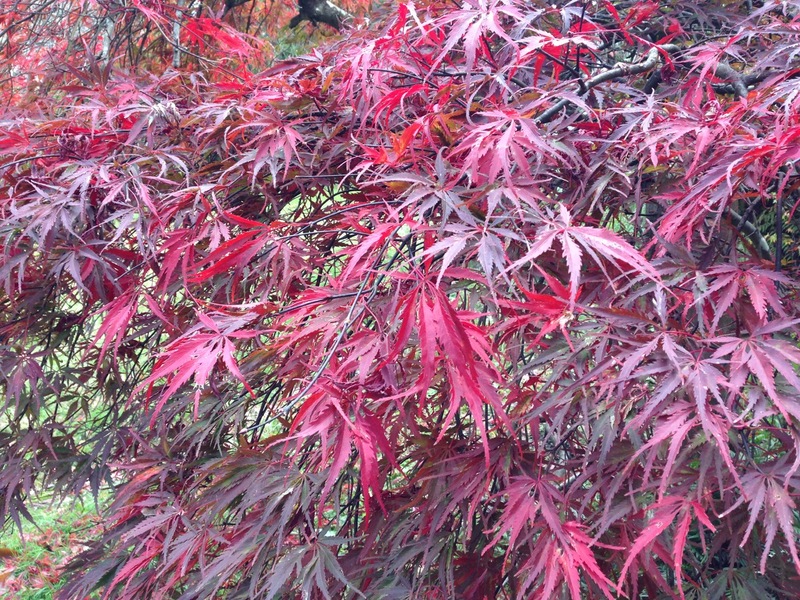 Even though the National Arboretum trees and very new, you can still see their distinct colours. The vision of the National Arboretum will be spectacular in years to come. I have placed a variety of trees in my landscaping to give visual appreciation of colour and shape over many months. I am excited to see it transform in the years to come. Louise, I think you have the best view of anyone in Canberra! It must be particularly stunning right now. I am also looking forward to seeing the National Arboretum develop over the years – it is promising to be a very special place, as I am sure your garden will be too. Enjoy the rest of autumn!